When Jeff and Amy Burch (right), owners of the Howard Park estate in Western Australia, visited Scotland recently I was delighted to meet up with them for dinner and a tasting of some of their current release wines. Howard Park burst into my consciousness in the late 1990s, when their wines began to pick up glowing reviews from top Australian commentators like James Halliday, and then from international critics too. Since then, I’ve been impressed not only by Howard park’s structured, savoury reds, but by some of Australia’s finest Rieslings. 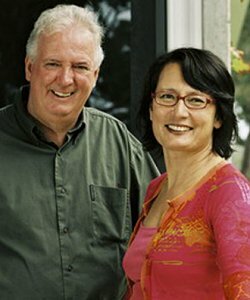 Their second label – Madfish – offers value for money wines that still express the balance and clarity of the house style. The Madfish Riesling was a double trophy winner at the National Riesling Challenge in Canberra 2005, when I was the International Judge. Jeff also revealed that the estate is converting some of its vineyards to biodynamic farming, and his viticultural team had just visited several biodynamic estates in Burgundy including Romanée Contí and Meo-Camuzet to study the subject. Indeed, the Burgundy connection goes futher, as Jeff also revealed a new jont venture with Burgundy’s Pascal Marchand, winemaker at Domaine de la Vougeraie. Combining Burgundian experience with Western Australian fruit, the Marchand & Burch wines come from vineyards that are already being farmed biodynamically, and includes varietal bottlings of Pinot Noir, Chardonnay and Shiraz. A small tasting of some of the wines from Howard Park’s range followed. Howard Park’s wines are distributed in the UK by Bibendum Wines. See wine-searcher for all stockists of Howard Park wines. The newest addition to the Howard park portfolio, fruit is sourced from vineyards across Western Australia. It has cool, citrus and apple fruit, with a touch of peach coming through. There’s a little grassy quallity too, and onto the palate this bursts into life, with a really crunchy, vibrant, lime and juicy apple quality. The freshness of the acidity and that grassy cut is tangy and vibrant. 88/100. From Hreat Southern fruit, this wine is made using free run juice only, partiallty wild fermented in barrel, and partially with neutral yeast. Only French oak is used, about 40% new. It has a deep but vibrant pale gold colour. There’s a lovely oak quality on the nose, with masses of toast and delicate spice married to a burnt orange fruit and hazelnut. On the palate this has a shimmering, bright, zinging lemony core of fruit. That orangy quality persists, but ther oak is pushed into the background, just adding a creamy, spicy finesse. 91/100. From the vineyard named after jeff’s father which is in the Margaret River, not generally regarded as a Shiraz area. Quite bright, minty, blackberry and mint chocolate nose, with a particularly peppery, cracked black pepper notes. The palate is fairly taut and lean, with a hint of charcoally minerality before black fruit with racy, edgy. plum-skin and blueberry qualities coming through. Good freshness here, the layers of chocolate and charry, toasty spices adding some warmth and depth on the finish. Stays juicy and fresh, with ripeness of the fruit persisting. 91/100. Mostly from a vineyard Jeff had been driving by and popping into every six months or so for three years, trying to get a hold of it. Out of the blue, the farmer called Jeff and finally sold it to him. Quite gamy and earthy, with perhaps a touch of reduction, and some ashy, earthy notes. There is nice blackcurrant fruit, but this is fairly lean and savoury, with a lean, citrus acidity pushing through. The spice and cedary quality of the oak starts to push in. Lovely freshness and savoury, food friendly leanness in the finish. 91/100. Made from Great Southern fruit, this is much brighter and mintier than the 2002 Cabernet Sauvignon, with a layer of vanilla and some creamy, ripe blackcurrant. It maintains a gamy, quite schisty and muscular edge. The palate has a lovely grip of plummy, cherry skin tart fruit, with tight, spicy wood tannins and fine balancing acidity. Lovely length and finesse here, as well as a core of wondefully succulent fruit. 92/100.